Artist Glenn Eure with the library of his work, collected by his wife, Pat. Images by K. Wilkins Photography. 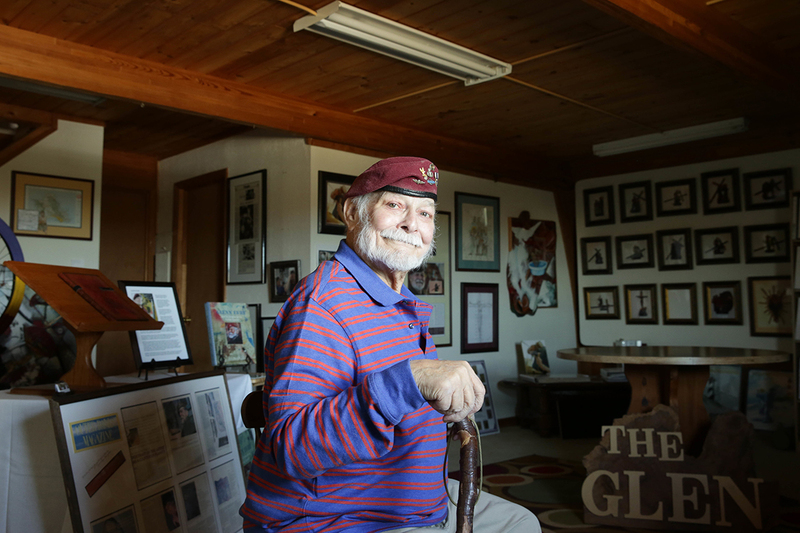 Ask anyone who knows him (and probably a lot of people who don’t), and they’ll all agree: Local artist and longtime Ghost Fleet Gallery owner Glenn Eure is a force of nature. And, at 85-years-old, he’s still a natural charmer who can light up a room (or even more simply, one person’s face) in no time at all. Timed right (as it inevitably is), it’s enough to elicit a blush from schoolgirls to seasoned matriarchs – and it’s pure, unadulterated Glenn as he basks in his element: bringing joy to everyone he meets by any means necessary. “Glenn’s led a lot of lives,” adds his wife, Pat, as she describes a decade’s-long evolution that’s seen him go from being known as the “barefoot painter” to the local artistic “ringleader” – and (most recently) has people referring to him affectionately as the “grandfather” of the Outer Banks’ art scene. But that’s just the basics. 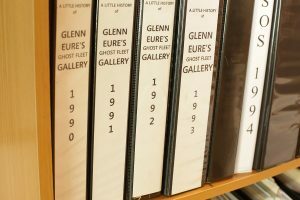 Which is partly why this year, for the very first time, Glenn Eure’s Ghost Fleet Gallery will open its 22nd annual Artist Self-Portrait Exhibition on April 1 in conjunction with a special unveiling of a brand-new permanent addition: The Glen. Puns aside, The Glen is an extensive gallery library that’s been a labor of love for Pat over the past few years. Filled with everything from sketches and canvases to photographs and framed articles, the library documents the diverse work Glenn’s done over the years (including designing Kitty Hawk’s Monument to a Century of Flight and hand carving the 15 Stations of the Cross for the Holy Redeemer by the Sea Catholic Parish) – but, as Pat observes, the heart of the library lies in the binders that fill several steel bookshelves’ worth of space. Binders filled with everything from sketches to photographs chronicling the gallery’s history. 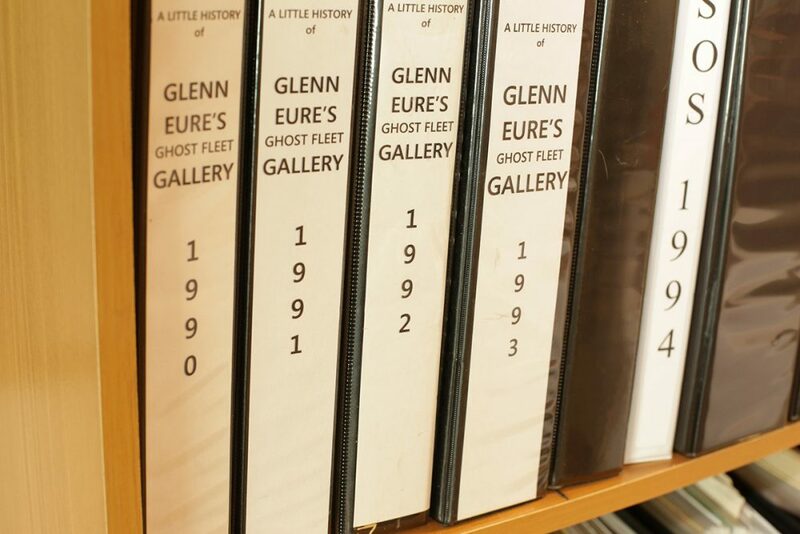 The binders (which are all titled “A Little History of Glenn Eure’s Ghost Fleet Gallery” plus the year) begin in 1973, and from 1986 on there’s at least one binder on display per year. Pat even created several specialty binders, such as the one she made for Glenn’s 80th birthday that contains some of his writing. The library itself is housed on the second level of the gallery – which functioned as an extension of their hanging space until 2014, and has been affectionately referred to as the “second dimension” for years (why? “It just sounded a lot better than the upstairs gallery,” explains Pat). Once it officially opens, visitors can climb the narrow curving staircase to leaf through decades’ worth of ephemera, learn a little about Glenn’s early life (he was born in Honolulu and earned a B.F.A. in printmaking after retiring from a long career in the Army) – and hopefully walk away with some sense of how important the arts have been to this community…and for how long. In fact, the oldest thing in the collection is an editorial by North Carolina journalist W.O. Saunders, in which he wrote that the Outer Banks was rapidly becoming a haven for creative individuals. The year that was published? 1935. Together, Glenn and Pat can reminisce for hours about years worth of events, gatherings and – especially – the people who have been so important to them and our community. Names like Denver Linley. Lillian Rosenthal. Ann Sandburg. Chester Smith. Russell Turner.